Objective The present study aimed to verify the effectiveness of self-monitoring of blood glucose (SMBG) in patients with non-insulin-treated type 2 diabetes (T2D). Methods A comprehensive literature search was conducted in PubMed, Cochrane Library, Web of Science, ScienceDirect and ClinicalTrials.gov from their respective inception dates to 26 October 2015. Eligible randomised controlled trials (RCTs) were included according to prespecified criteria. The quality of the included RCTs was evaluated according to the Cochrane risk of bias tool, and the evidence quality of meta-analyses was assessed by the Grading of Recommendation, Assessment, Development, and Evaluation (GRADE) criteria. A meta-analysis of primary and secondary outcome measures was performed. Sensitivity and subgroup analyses were carried out to evaluate the robustness and heterogeneity of the findings. Begg's and Egger's tests were used to quantify publication biases. Results A total of 15 RCTs, comprising 3383 patients with non-insulin-treated T2D, met the inclusion criteria. The SMBG intervention improved glycated haemoglobin (HbA1c) (mean difference −0.33; 95% CI −0.45 to −0.22; p=3.0730e−8; n=18), body mass index (BMI; −0.65; −1.18 to −0.12; p=0.0164; n=9) and total cholesterol (TC; −0.12; −0.20 to −0.04; p=0.0034; n=8) more effectively than the control in overall effect. The sensitivity analysis revealed little difference in overall effect, indicating the robustness of the results. 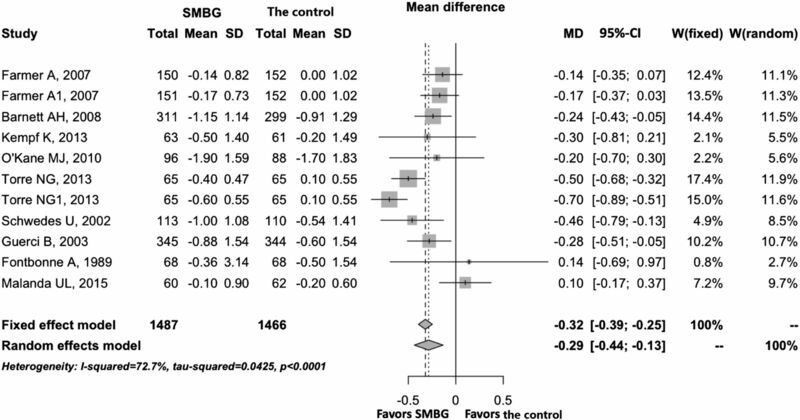 SMBG moderated HbA1c levels better than the control in all subgroup analyses. Most of the RCTs had high risk of bias in blinding, while the overall quality of evidence for HbA1c was moderate according to the GRADE criteria. Publication bias was moderate for BMI. Conclusions SMBG improved HbA1c levels in the short term (≤6-month follow-up) and long term (≥12-month follow-up) in patients with T2D who were not using insulin. It is the most comprehensive meta-analysis to include the latest randomised controlled trials (RCTs) and evaluates more clinical indexes (including systolic blood pressure (SBP), diastolic blood pressure (DBP), weight, body mass index (BMI), triglyceride (TG), total cholesterol (TC) and waist circumference) than previous meta-analyses. It is the first meta-analysis to investigate the association of geographical regions (Asia and America–Europe) with the effectiveness of SMBG. It provides a clear demonstration that SMBG is significantly effective in controlling glycated haemoglobin (HbA1c), BMI and TC levels in the short term, while a clinically significant change in the long term is only observed in patients with newly diagnosed T2D with mildly elevated HbA1c. In 2011, £158 million was spent on self-monitoring of blood glucose (SMBG) by the UK's National Health Service (NHS), accounting for 21% of diabetic prescription costs.1 The Centers for Disease Control and Prevention (CDC) estimated that the daily usage rate of SMBG in the USA was 63.4% among patients with diabetes,2 while the Diabetes Glycaemic Education and Monitoring (DiGEM) trial reported that the 12-month costs of SMBG were similar in both less intensive (£92) and more intensive (£84) SMBG groups.3 SMBG has been reported effective in the management of type 1 diabetes mellitus.4 ,5 However, there remains a lack of consensus over the effectiveness of SMBG for self-management of patients with non-insulin-treated type 2 diabetes (T2D), despite several meta-analyses having investigated the issue.6–13 Given the high costs incurred during SMBG, if the technology was found to be ineffective in the treatment of patients with T2D without insulin administration, the expenditure would be in vain. Conversely, if SMBG was proven effective, over 200 million patients with T2D living in low-income and middle-income countries could be advised to manage their disease through SMBG as a relatively low-cost health technology. Several meta-analyses7 ,12 ,13 deemed that SMBG was effective in decreasing glycated haemoglobin (HbA1c) levels in patients with T2D. Others6 ,8 found that the SMBG group did not fare significantly better than the control group, but varied in the length of follow-up. The latest meta-analysis was a Cochrane review published in 2012, which suggested that SMBG had a minimal effect on improving glucose control at 6 months (mean difference −0.26; 95% CI −0.39 to −0.13), but the effect disappeared after 12 months (−0.13; −0.31 to 0.04); thus, the clinical benefit was limited.6 Since then, more randomised controlled trials (RCTs)14–17 have been published, of which three14 ,15 ,17 suggested that SMBG improved diabetic control beyond the levels estimated by the last Cochrane review6 (ie, at 6 and 12 months), and one16 reported no significant differences between SMBG and usual care for changes in HbA1c levels. Regardless of the controversial results of these previous reviews and recent RCTs, the last Cochrane review is already outdated. Therefore, the present study aimed to re-estimate the effects of SMBG in patients with non-insulin-treated T2D through a meta-analysis of RCTs. Given the significant efficacy and safety differences observed among ethnic groups in the DURAbility of Basal versus Lispro mix 75/25 insulin Efficacy (DURABLE) trial,18 the present study also investigated the possible associations of ethnicity and living environment with SMBG. Included studies met the following criteria: (1) RCTs comparing SMBG with usual care (or no SMBG) in patients with non-insulin-treated T2D above 18 years of age; (2) RCTs reporting HbA1c levels; and (3) RCTs reporting fasting plasma glucose (FPG), body mass index (BMI; calculated as weight in kilograms divided by square of the height in metres), diastolic blood pressure (DBP), systolic blood pressure (SBP), high-density lipoprotein (HDL), low-density lipoprotein (LDL), triglycerides (TGs), total cholesterol (TC), waist circumference (WC) and weight (if available). The primary outcome measure in this study was HbA1c improvement and the secondary outcome measures were FPG, BMI, DBP, SBP, HDL, LDL, TG, TC, WC and weight improvement. Meeting summaries and abstracts were excluded. PubMed: ((self-monitoring of blood glucose[Title/Abstract] OR SMBG[Title/Abstract]) AND (type 2 diabetes [Title/Abstract] OR T2D [Title/Abstract])) AND ((no insulin [Title/Abstract] OR insulin [Title/Abstract]) OR non-insulin [Title/Abstract]). Web of Science: TS=(SMBG OR self-monitoring of blood glucose) AND TS=(T2D OR type 2 diabetes) AND TS=(non-insulin OR using insulin OR no insulin). ScienceDirect: TITLE-ABSTR-KEY ((SMBG OR self-monitoring of blood glucose) AND (T2D OR type 2 diabetes) AND (non-insulin OR using insulin OR no insulin)). The Cochrane Library: self-monitoring of blood glucose or SMBG in Title, Abstract, Keywords AND no insulin OR non-insulin in Title, Abstract, Keywords AND type 2 diabetes OR T2D in Title, Abstract, Keywords. Two reviewers (HZ and YZ) independently performed the literature searches and selection. The articles retrieved by one reviewer were crosschecked by the other. Disagreements were resolved by group discussion or in consultation with a third reviewer (S-wL). Extracted data were transferred to the ‘metafor’ package22 in R software for meta-analysis with a random-effects model. Continuous outcome measures were calculated and represented as mean differences (MDs) and their 95% CIs. Heterogeneity among RCTs was evaluated with I2 statistics. p Values <0.05 were considered statistically significant. A sensitivity analysis was performed on sample size to assess the robustness of the findings. Sample size is a dominant factor that affects precision in determining overall effects. Thus, the meta-analysis was repeated after excluding studies with sample sizes of 99 or less. Subgroup analyses were performed to explain the heterogeneity in terms of geographical region, follow-up period and diabetes history, according to the characteristics of the included studies. The Mann-Whitney-Wilcoxon test was used to determine the differences across subgroups. Meta-analyses on the overall adverse effects in terms of ORs and their 95% CIs were performed with a random-effects model. Funnel plots were generated to visualise any possible publication bias. Begg's rank correlation test23 and Egger's regression test24 were performed to evaluate the statistical significance of the publication bias. A metaregression with a mixed-effects model employing the restricted maximum likelihood (REML) estimation was performed to examine the possible relationships between the overall effects and factors such as sample size, history of diabetes, follow-up period and publication year. A classification tree was manually constructed to indicate who might benefit from SMBG. The classification tree example in online supplementary figure S3 can be interpreted as, ‘the mean starting HbA1c of tested patients was no less than 8%, then if the follow-up period of trials was short (no more than 6 months), then if the tested patients from Asia, then if the patients is newly diagnosed’. Unpaired t-tests were performed with R software for two-group comparisons. A total of 1533 records were retrieved in accordance with the specified search strategies from PubMed (n=246), Web of Science (n=400), ScienceDirect (n=352), Cochrane Library (n=234), Google Scholar (n=266) and ClinicalTrials.gov (n=35). Following removal of duplicates, 683 records were screened, of which 50 were assessed for eligibility. Finally, 15 records were included after full-text assessment (see online supplementary table S1). Figure 1 shows the study selection process and the reasons for exclusion. The 15 studies14–17 ,25–35 meeting the inclusion criteria comprised a total of 3383 patients with non-insulin-treated T2D. Among the 15 studies, 13 studies had HbA1c as their primary outcome and the other two16 ,17 had HbA1c as a secondary outcome. A total of 915 ,25 ,26 ,29–31 ,33–35 of the 15 studies were two-armed trials comparing SMBG with usual care or no SMBG, while 6 studies14 ,16 ,17 ,27 ,28 ,32 were three-armed trials. Among the three-armed trials, three16 ,28 ,32 compared SMBG and self-monitoring of urine glucose (SMUG) with usual care, two17 ,27 compared less intensive SMBG and more intensive SMBG with a control group, and one14 compared fingertip SMBG and palm SMBG with a control group. Flow chart of study selection. The process of study selection included literature search, abstract screening, eligibility evaluation and study inclusion for meta-analysis. RCT, randomised controlled trial; SMBG, self-monitoring of blood glucose; T2D, type 2 diabetes. A meta-analysis was performed on the primary outcome measure of HbA1c and secondary outcome measures of FPG, BMI, DBP, SBP, HDL, LDL, TG, TC, WC and body weight (table 1). The SMBG group was shown to perform better for HbA1c (MD −0.33; 95% CI −0.45 to −0.22; p=3.0730e−8; n=18), BMI (−0.65; −1.18 to −0.12; p=0.0164; n=9), TC (−0.12; −0.20 to −0.04; p=0.0034; n=8) and WC (−2.22; −4.40 to −0.03; p=0.0474; n=5) compared with the control group. There were no significant differences with regard to FPG, DBP, SBP, HDL, LDL, TG and weight between the SMBG and control groups. Among the studies, significant heterogeneity was found for HbA1c (I2=63%, p=0.0002), BMI (I2=89%, p=0.0009), LDL (I2=89%, p=0.0009) and SBP (I2=65%, p=0.0100). A forest plot of HbA1c is shown in figure 2 to allow visual assessment of the heterogeneity. Forest plot of HbA1c for overall effect, showing the mean differences between SMBG and the control with corresponding 95% CIs in the individual studies. HbA1c, glycated haemoglobin; SMBG, self-monitoring of blood glucose. Online supplementary figures S1 and S2 show the quality of the included RCTs assessed by the Cochrane Risk of Bias Tool. Almost 50% of the RCTs did not provide adequate information about random sequence generation, allocation concealment and selective reporting. All of the included studies had high risk of bias in blinding of participants, because the participants could not be blinded to the intervention, and only four RCTs had low risk of bias in blinding of outcome assessment. Other key aspects identified among the RCTs were mostly low for risk of bias. Table 1 shows the evidence quality of the meta-analyses evaluated by the GRADE criteria. The overall quality of evidence for HbA1c was moderate, with significant heterogeneity across studies (I2=63%; p=0.0002; n=18). The quality of evidence for FPG, TG and TC was rated as high. A sensitivity analysis was performed on studies with sample sizes of 100 or above to test the robustness of the overall effects. As shown in table 2, there were minor changes in the significance of SMBG for HbA1c, BMI, TC and WC, indicating the robustness of the overall effects. A forest plot of HbA1c is shown in figure 3. Forest plot of HbA1c for sensitivity analysis, showing the mean differences between SMBG and the control with corresponding 95% CIs in the individual studies whose sample sizes were bigger than 99. HbA1c, glycated haemoglobin; SMBG, self-monitoring of blood glucose. A total of 7 of the 15 studies reported adverse events. As shown in online supplementary table S5, the most commonly reported adverse event was hypoglycaemia. The incidence of hypoglycaemia was higher in the SMBG group than in the control group, but the rate of hypoglycaemic episodes per patient was higher in the control group. A statistical analysis of adverse events was not performed because the data available from the RCT reports were insufficient in terms of quantity. Funnel plots of the outcomes for HbA1c, FPG, BMI, DBP, SBP, HDL and LDL showed various levels of asymmetries across the studies, indicating possible publication bias. Begg's rank correlation test and Egger's regression test detected moderate publication bias for BMI (see online supplementary table S6). The results of the funnel plots, Egger's test and Begg's test are not presented in the main text, because they are not recommended for fewer than 10 studies based on a high risk of inaccurate interpretation. SMBG performed better for HbA1c than the control under all tested conditions, and better for BMI and TC under most of the tested conditions but with heterogeneity. Therefore, a metaregression was performed to analyse the relationships between these three outcomes and the study characteristics (including sample size, publication year, history of diabetes and follow-up) and test the source of the heterogeneity. As shown in table 3, there seemed to have significant relationships between BMI and history of diabetes, and between BMI and follow-up period. There was also a statistically significant association between history of diabetes and HbA1c. 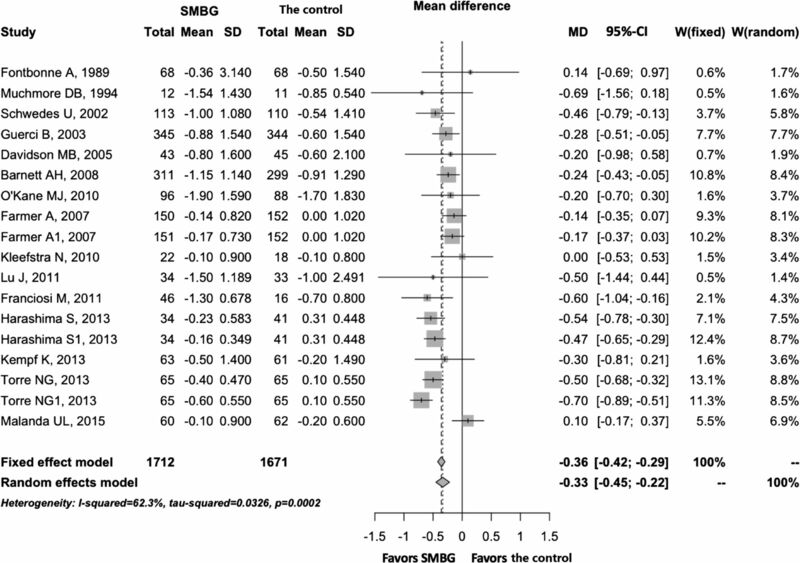 The present meta-analysis included 15 RCTs, comprising 3383 participants, to assess the effectiveness of SMBG in patients with non-insulin-treated T2D with the primary outcome of HbA1c levels. A sensitivity analysis on sample size and subgroup analyses on geographical region and SMBG history were also performed, together with assessment of the associations of ethnicity and living environment with SMBG, because significant efficacy and safety differences were previously observed among racial/ethnic groups in the DURABLE trial.18 Various clinical indices, including SBP, DBP, body weight, BMI, TG, TC and WC, were also analysed and reported for the first time in this study. A comparison of the RCTs included in this meta-analysis with those included in some previous meta-analyses is presented (see online supplementary table S7). The results for overall effects suggested that use of SMBG by patients with non-insulin-treated T2D led to a significant reduction in HbA1c levels (MD −0.33; 95% CI −0.45 to −0.22; p=3.0730e-8; n=18), which is consistent with previous systematic reviews.7 ,12 ,13 The sensitivity analysis of studies with large sample sizes showed that SMBG could help reduce HbA1c levels in a robust manner. The subgroup analysis of geographical regions revealed that significant decreases in HbA1c levels were observed in the Asia and America–Europe groups. SMBG improved the HbA1c levels in the short term (≤6 months), but also had long-term effects (≥12-month follow-up), being different from the Cochrane review.6 Significant reductions in HbA1c levels were also found in newly diagnosed patients and patients with diabetes for more than 12 months, indicating that SMBG seemed to benefit patients with T2D regardless of diabetes duration. The quality of evidence for HbA1c was rated as moderate, which was the same as the last Cochrane review.6 The factors influencing the evidence quality mainly appeared to be small effect size and significant heterogeneity in this meta-analysis. The above-discussed evidence indicates that SMBG helped to improve glycaemic control, but under a single specific test condition. Thus, combinations of two or more test conditions are required to address the issue of what type of patient under what kind of intervention would achieve improvement of glycaemic control by SMBG. A classification tree method was adopted to show the influence of baseline HbA1c, follow-up period, geographical region and diabetes duration on SMBG. As shown in online supplementary figure S3, SMBG improved glycaemic control regardless of baseline HbA1c, while SMBG was significantly more effective in control patients with lower HbA1c (<8%) than in those with higher HbA1c (≥8%). Among the patients with lower HbA1c, SMBG improved glycaemic control in the short term and long term, and performed better in the former. Furthermore, SMBG might have long-term effects in the improvement of glycaemic control in newly diagnosed patients with T2D with lower HbA1c. All of the evidence shown in online supplementary figure S3 indicates that SMBG has a short-term effect in T2D, and that a clinically significant change in the long term is only observed in newly diagnosed patients with T2D with lower HbA1c. There are several limitations to this meta-analysis. First, the sample sizes in some of the included studies were too small to confidently exclude a difference in response in the reduction of HbA1c and clinical indices between the SMBG and control groups, and this might be a source of heterogeneity. Second, the heterogeneities of the pooled effect sizes on HbA1c were high, and according to previous reviews8–10 and the RCTs included in this meta-analysis, the most important heterogeneities might arise through the intensity of education, intervention components coupled to SMBG and frequency of SMBG testing. Third, there were no properly collected data for a statistical analysis of adverse events and economic assessment. Fourth, potential synonyms for SMBG and diabetes were not included in the strategy, and EMBASE was not searched, which may have led to relevant papers being missed and possible publication bias. Finally, although SMBG did not achieve the 0.5% reduction in HbA1c deemed a clinically significant change,10 it significantly reduced the HbA1c level under all tested conditions. Last, the present evidence warrants further research, because some outcome measures were reported by fewer studies and the potential associations among the outcome measures remain unclear. In patients with T2D who were not using insulin, SMBG improved the HbA1c level in the short term and long term. This work originated from a postgraduate course project supervised by the corresponding author. After completing the course, the leader of this project group (YZ) and the other two authors of this manuscript found errors in study design and data; thus, they redesigned the study and criteria for study eligibility. The authors are grateful to the other project team members Runmiao Wang and Zichao Gao for their help in the original group project, although they cannot be included as authors according to the ICMJE's authorship guideline. National Prescribing Centre. Data focused commentary: type 2 diabetes: selfmonitoring blood glucose. 2012. http://www.npc.nhs.uk/therapeutics/cardio/diabetes_2/resources/dfc_self_monitoring_of_blood_glucose.pdf (accessed 25 Feb 2015). Centers for Disease Control and Prevention. Prevalence of self-reported cardiovascular disease among persons aged > or =35 years with diabetes--United States, 1997–2005. MMWR Morb Mortal Wkly Rep 2007;56:1129–32. Greater Los Angeles Veterans Affairs Healthcare System/Southern California/RAND evidence-based Practice Center. Self-monitoring of blood glucose in patients with type 2 diabetes mellitus: meta analysis of effectiveness. 2007; Sep:1–46.
. Efficacy of self-monitoring of blood glucose in patients with type 2 diabetes mellitus managed without insulin: a systematic review and meta-analysis. Open Med 2010;4:e102–13.
. Impact of race/ethnicity on efficacy and safety of two starter insulin regimens in patients with type 2 diabetes: a posthoc analysis of the DURABLE trial. Ethn Dis 2013;23:393–400.
. PROSPERO International prospective register of systematic reviews. 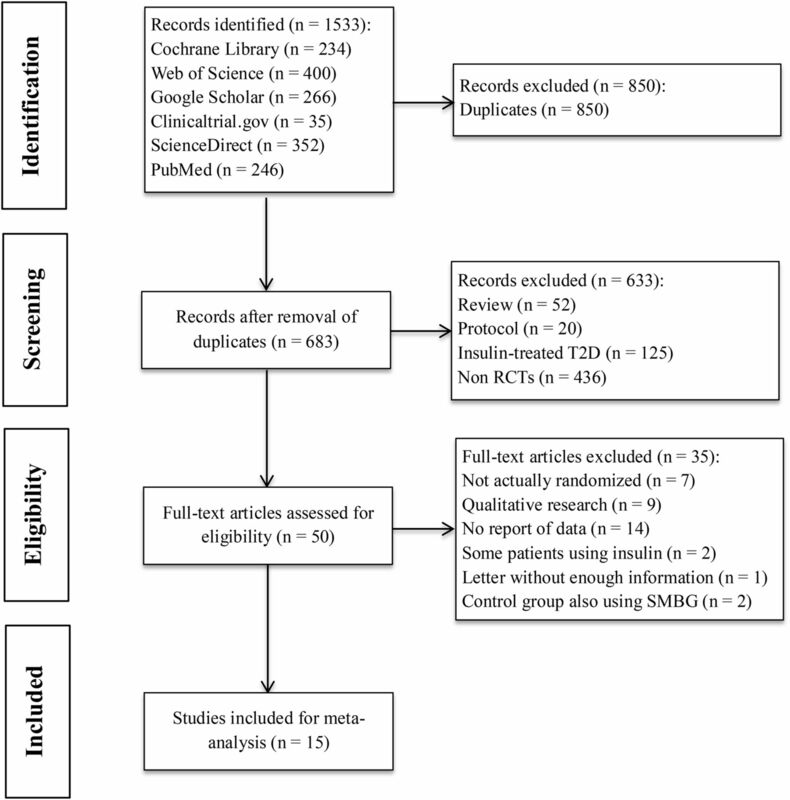 The efficacy of self-monitoring of blood glucose in non-insulin treated type 2 diabetics : a systematic review and meta-analysis of randomized controlled trials. 2015:2–4. http://www.crd.york.ac.uk/PROSPERO/display_record.asp?ID=CRD42015019099. (accessed online Aug 2016).
. Is glucose self-monitoring beneficial in noninsulin- treated diabetic patients? Results of a randomized comparative trial. Diabete Metab 1989;15:255–60.
. ROSES: role of self-monitoring of blood glucose and intensive education in patients with Type 2 diabetes not receiving insulin. A pilot randomized clinical trial. Diabet Med 2011;28:789–96.
. Self-monitoring of blood glucose in tablet-treated type 2 diabetic patients. Neth J Med 2010;68:311–16. Contributors S-wL is the guarantor of this work and conceived the meta-analysis. S-wL, HZ and YZ designed the protocol. HZ and YZ searched the databases, assessed and selected studies, and extracted and analysed the data from the selected studies according to the eligibility criteria. HZ and YZ interpreted the data and drafted a report on the findings. S-wL revised the manuscript for submission. All authors read and approved the final version of the manuscript. Funding This work was supported by the University of Macau (MYRG2014-00117-ICMS-QRCM).